He crawls into the night on his sadistic belly, he sneaks into your private and most intimate moments and he feeds on your fears. He will steal from you everything you want to hide. When your last thoughts pass before you in that final moment before your guts are spilled on the asphalt of the main street, before it all your life goes down the drain he will be there, filming. He will be there, happy. He will be there with his flash and with his digital HD camera taking it all away from you. Even that precious moment which should be truly yours, which should be the most intimate moment you ever had – the moment of your death – will not be yours anymore. He crawled into you and severed the connections that you were holding so manically that they’ve become so thin you can’t even see them anymore. There is no life anymore. There is only night. Night is where he is. Your spilled blood on the street is what we all crave in the evening news while we have our communion. We are mass in this dark church and he is the priest. You, I’m sorry, aren’t important. You are just a snack. Appetizer if you want. We’re not there on the street, dying. You are. Thank God for that. Him too. He brought us the film, he brought us the reality of it all. It’s not an act in some special-effect fed Hollywood movie. It’s real. We’re still here and you’re not. Tough luck. Next clip will always be more interesting than the last. You are maybe dead now but you’re yesterday’s news. You don’t sell, you don’t give the ratings anymore. “Nightcrawler” knows. He follows what needs to be followed. That same speech we will give to some other poor bloke who will be spilling his intestines before the camera, before the millions of thirsty, true believers. Again and again, day after day. He will again crawl into the night and he will deliver us our meal we so desperately need. No questions asked, that’s what we’ve become. I already compared “Nightcrawler” to “Boyhood” in the previous text. “Boyhood” gives us slices of life, while “Nightcrawler” gives us extremes of life. “Boyhood” is about ordinary and “Nightcrawler” is about the scariest part of life. It confirms that if somebody dies today you won’t need telegram or phone call, if accident happens you won’t need the newspaper to read it from… you will probably be there, with your smart-phone, filming it all. Something like that was said in stand-up performance by Dylan Moran and we all laughed. However, joke is on us. “Nightcrawler” is the new kind of hyena, new kind of vulture. “Nightcrawler” has no boundaries beside the ratings, and more bizarre the event the more bizarre he is. 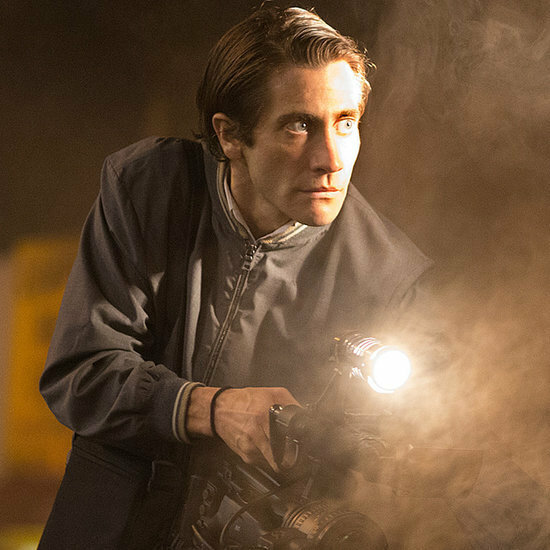 Because “Nightcrawler” is not a movie, “Nightcrawler” is Lou Bloom and in some broken image of the society – we all are “Nightcrawler”. 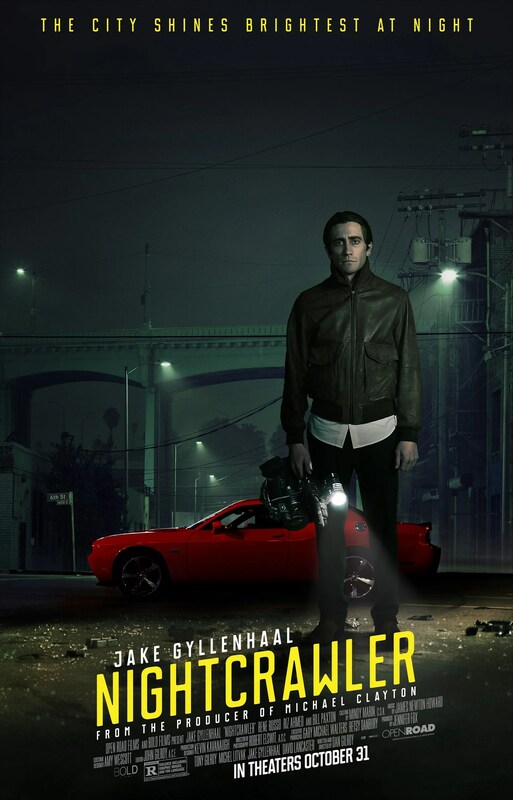 Lou Bloom is “Nightcrawler” – Jake Gyllenhaal is “Nightcrawler”. I respect Rene Russo and Riz Ahmed, but Jake is the dominant figure in the movie the same way that De Niro was in “Taxi Driver”. There is even a scene in which Jake is facing the mirror and I couldn’t help myself but think that he was “talking to me”. He is scary. He is jackal waiting to bite, waiting to feed. He’s an extreme case of narcissism and potential serial killer. He’s the man who creates news we all want to see. Ratings don’t lie. Sales don’t lie. Nobody wants polished news anymore. Nobody wants ordinary lives. You’ve seen “Boyhood”. You’ve seen the critics saying: “It’s commendable for Linklater to film the 12 year period, but it would be more interesting if he didn’t choose the most boring family of them all. I had more fun with my family when I was planting salad in the garden than while I’ve been watching this movie”. We don’t wont ordinary. We don’t won’t something that’s not extreme. Questions of ethics just don’t apply here. Romans were watching gladiators in bloody fights to the death, we’re watching our own gladiators. But, unlike Romans, we have a bonus. We don’t have to attach ourselves to the specific fighter. We can just be happy that we weren’t in the arena. Magnificent. Who said that humans don’t evolve? Lou Bloom is a modern gladiator. You don’t see him but he provides. He is winning every fight. For that reason alone, Jake should’ve been nominated for “Oscar” in Lead actor category, he was the film, he carried the plot, he transformed into unique monster unlike anything I’ve seen on film in the last few years. Horror is, he is maybe the same monster we all are. Because of that “Nightcrawler” should’ve been nominated in Best movie category. Instead of “American Sniper” as Jake should’ve been there instead of Bradley Cooper. 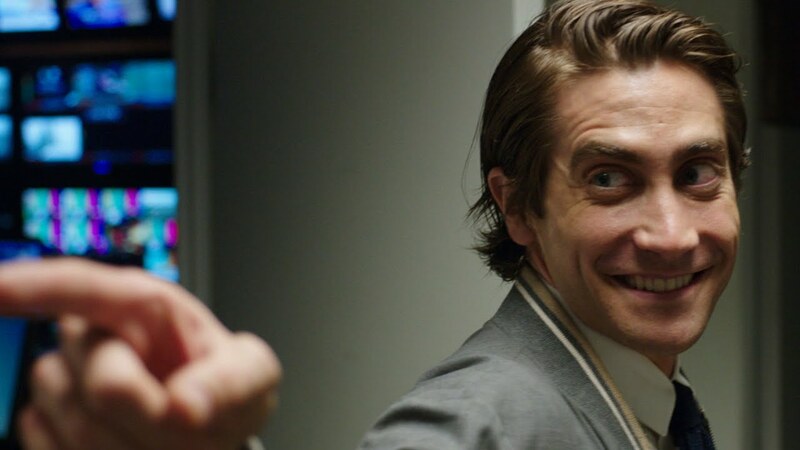 Academy didn’t do justice to “Nightcrawler” but Bloom will certainly do justice to the test of time. One of the films that is destined to become cult. Jake should’ve been there last year too, for the “Prisoners”, but he didn’t. This year it was “Nightcrawler”, next year “Boxer”? He didn’t deserve the award, just to be sure. Redmayne is my favorite there and I’ll write about why in the days to come, but the tragedy is that he didn’t get the nomination. He crawled into the night and forced me to look into dark corners of myself and I didn’t like what I have seen. Read first paragraph again.